An advert for lip fillers, targeted at young girls, has been banned for "irresponsibly" presenting the procedure as normal and safe. The Royal Tunbridge Wells Skin Clinic (RTWSkin) ad ran in Index Magazine. It read "Is your daughter [taking] an interest in lip fillers?" and said the procedure was as common as a haircut. RTWSkin director John Sheffield said he was "shocked at the attitude and conclusions" of the Advertising Standards Authority (ASA). A reader complained when they saw the ad in October. It stated: "Dermal fillers are very quickly becoming as commonplace as getting your hair done these days and even more so within the younger age group." The ad claimed "young girls" increasingly underwent such procedures, often brought in by their mothers. It said parents would rather help their children "find somewhere safe and suitable" for treatment, instead of saying no and pushing children to "go behind their backs, blindly searching for the cheapest practitioner without realising the risks". 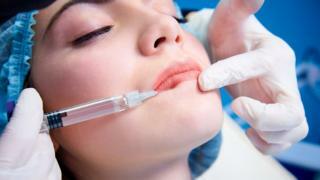 The ASA said the ad created the impression the risks of lip fillers were associated only with unsuitable practitioners, and made no reference to the risks always attached to the procedure. It added: "By presenting lip fillers as normal and safe... and something that responsible parents should support, the ad was irresponsible." RTWSkin said a 20-year-old member of staff wrote the ad. In a statement to the ASA she said her peer group was "vulnerable to the messages put out by reality TV shows and social media", and had concerns about poor outcomes from treatments, so believed education and discussion of the subject was important. Mr Sheffield said "many" young people visited the clinic for a free consultation as a result of the ad, and 30% opted for treatment. He said: "In the vast majority of cases, we were able to satisfy the person that they did not need this procedure. Video Perfecting the pout: Which city is the UK's lip filler capital?